The European food safety testing market is driven by the stringent food safety regulations imposed by European Food Safety Authority (EFSA) to prevent increasing outbreaks of foodborne illnesses and poisoning. The EFSA specifies that food manufacturers in Europe are responsible for safety of food that further helps to drive the market. The report briefly describes the European food safety regulations based on the contaminants present in food products. The global issue of GMOs and potential health risks upon consumption of contaminated foods are the significant drivers of European food safety testing market. The report describes the market in terms of both value and volume. The market segments include contaminants, technologies, food types, and regions. The report spans the market for five leading food safety testing countries such as U.K., Germany, France, Italy, and Poland. The report explicitly describes the market for technologies used to test for contaminants in different food types and contaminants tested in food types and countries. In 2012, salmonella testing accounted for major share in the European market. The application of rapid technology for contaminant testing has been increasing. The report provides analysis on the key players, technologies, and developments in the European food safety testing market. The report also includes the preferred competitive strategies adopted by the leading players to garner a larger share in the market. The European food safety testing market is growing significantly, driven by rigorous implementation of the food safety regulations to ensure the safety of food and globalization of food supply. The consumer demand for food safety in Europe has also been increasing the food safety testing market. The contamination of food products with genetically modified food and their unknown effect upon consumption has been driving the food safety testing demand in the market. Introduction of new and advanced technology for safety testing has been further helping in the growth of the market. The European food safety testing market include testing for contaminants such as pathogens, toxins, genetically modified food, pesticides, and other contaminants in the food products such as meat & poultry products, dairy products, processed foods, and fruit & vegetable, etc. The technology for safety testing include traditional and rapid technology methods such as convenience-based, PCR-based, immunoassay-based, and other rapid methods such as HPLC, GC, etc. The food safety testing market is projected to grow reach to $4,068.8 million by 2018. In 2012, Germany was the largest market for food safety testing and it is projected to be the fastest growing market in Europe. 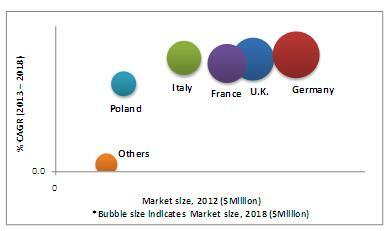 In 2012, U.K. was second largest market followed by the France. 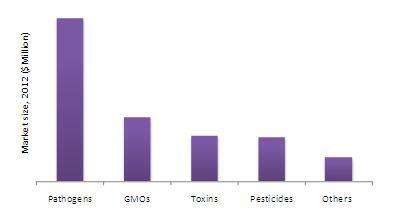 In 2012, contaminant testing in fruit and vegetable was the largest segment in European market. In 2012, pathogen testing dominated European food safety testing market followed by GMOs testing. Pathogen safety testing in food samples was dominated by salmonella testing as the largest segment. The leading market players have been using strategies such as new product/service launch to detect the presence of contaminants in the food samples to strengthen their position in the market. 11.6 Eurofins Central Analytical Laboratories Inc.